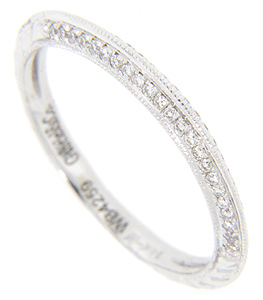 A double row of diamonds decorates the top 1/3 of this 14K white gold antique style wedding band. The diamonds measure approximately .17 carats total weight. Engraving is worked further down the ring’s sides. 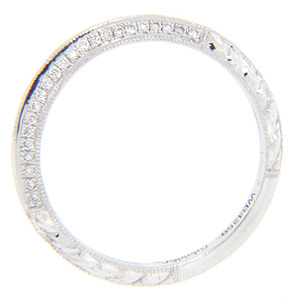 The wedding ring measures 2.5mm in width. Size: 6 1/2. We can re-size.